Located on the south side of O’Neal Road, on both sides of Conway Road, one mile east of the Noland/Portal Road, 4.5 miles south of I-10. 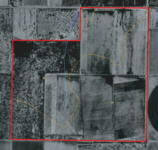 RU-4-Rural 4 acre minimum/Irrigated Field Crops/Desert/Fallow & Farmstead. 390± acres of historical pumping under furrow irrigation in prior years. Located outside of all existing AMA’s and INA’s, no local irrigation districts. Three operating and equipped irrigation wells, estimated by owner to produce 3,000± gpm total. Electric, natural gas. Electric service to all wells. Zone A – 140± acres from Whitetail Creek; Zone C – 420± acres. 560± gross acres, 340± acres farmed under three center pivots, 40 acres with drip irrigation, 180 acres of desert, pivot corners and roads. No building improvements. Various loams, see soil maps attached. 3,750’ on south side to 3,704’ on north side. Slope is from south to north. Physical access is via County graded dirt roads. Fronts on the south side of O’Neal Road, a two lane dirt roadway. Three electric motors and turbine pumps, three center pivots, underground drip system on 40 acres. $1,960,000 or $3,500 per gross acre. Please click here to download (about 700kb) a printable brochure in Adobe Acrobat format. If you get frustrated trying to make this work on your computer, don't hesitate to ask us to mail you a printed and bound brochure instead.